My stash hasn’t changed a bit, either in or out. I did pull fabrics from it for the guild mystery quilt, but I’m not counting that til I actually start on it. I have been working on some projects, though. I quilted one customer lap quilt, and have another ready to start. My parents came for a visit Saturday, so Friday afternoon was spent cleaning, and getting ready. I really enjoyed our time together Saturday. 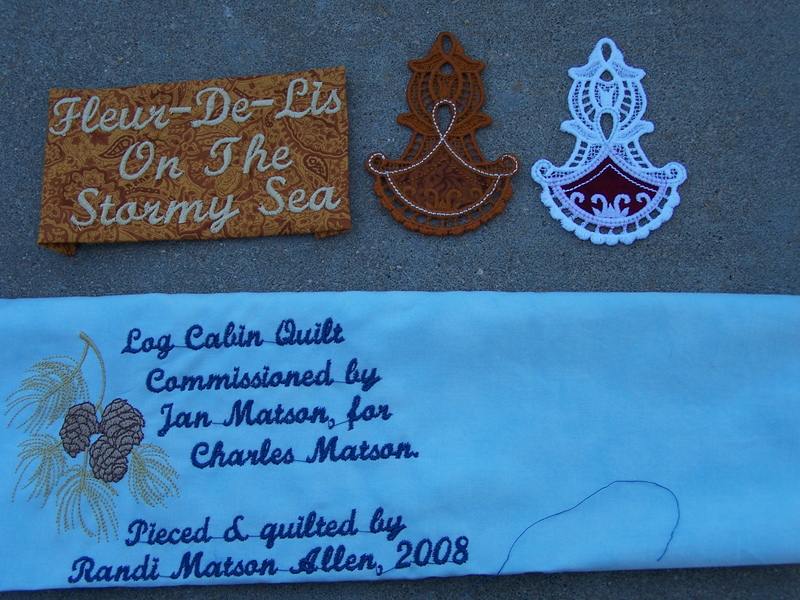 I demo’d my embroidery machine for Mom, by working on the label for my Dad’s log cabin quilt. Then, after they left, I just had some play time with it. I got these Christmas ornament patterns, at the shop where my machine came from. They are an OESD Christmas promo. You spend $60.00 shopping, and you get the patterns for free. This is the one I made last night. I used a red that had been prewashed, but after wetting it to get the stabilizer out, and leaving it overnight to dry, the red still bled through the white stitching, turning it pink around the edge of the applique. And, I don’t think I had my tension set quite right on this one. Today, as I was making a label for the back of my Storm At Sea quilt, I thought that a scrap of that fabric might make a neat ornament, so I played with a different color theme. The ornament is still wet, from rinsing out the stabilizer, but when it’s dry, it will be the same color as the label it is laying beside. Also in the pic, is the label for Daddy’s quilt. I still need to trim it up. 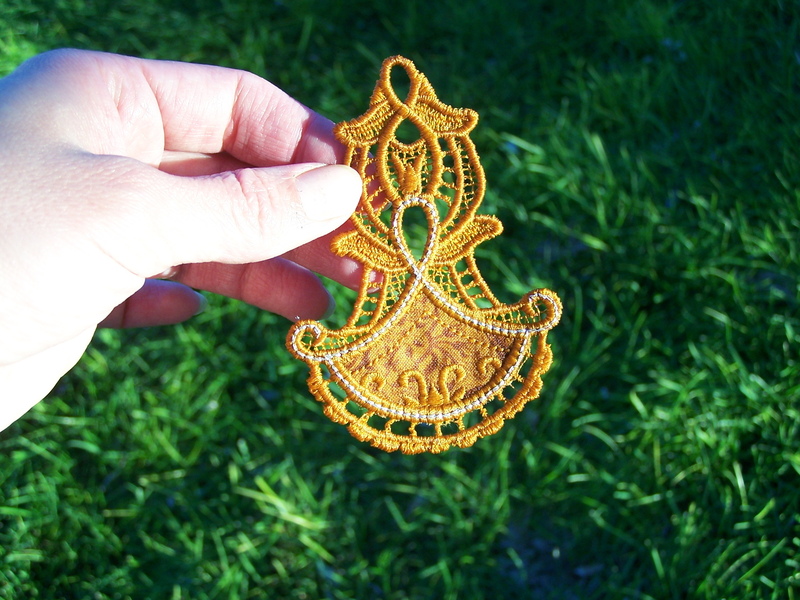 I like the way the ornament came out, in the golden color, with a bit of silver metallic thread for some sparkle. I will add some crystals for further embellishment. I think I’ll be making some more of these. It was fun! 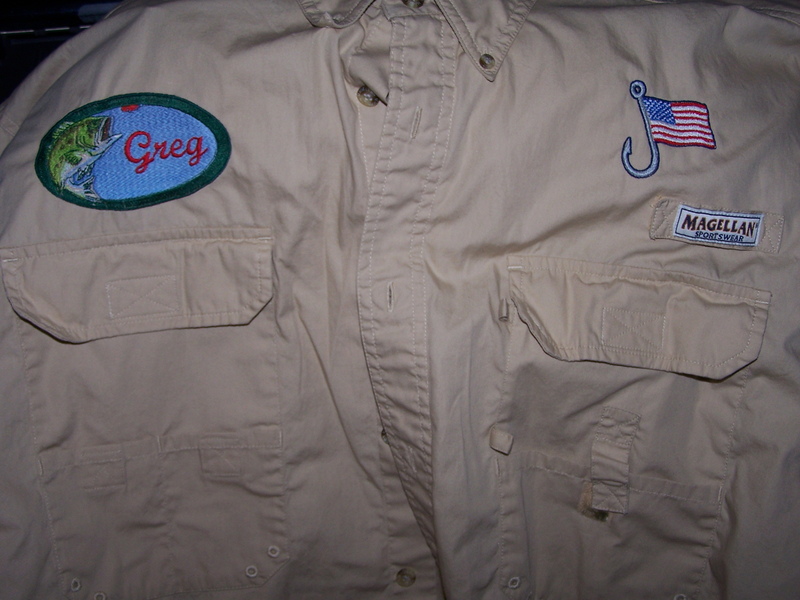 I also jazzed up one of my DH’s fishing shirts, by adding a couple of embroidered designs to it. He loves it! I was so proud of myself for getting them on so straight, and even symmetrical with each other! And, I got the labels for the commissioned memorial quilt ready to stitch. All in all, I had a really nice weekend. Just too short, as usual. Hope yours was great, too! I’m off to soak in the new infinity pool hot tub now! The ornaments are really cool! Great work this weekend! Isn’t embroidery fun? 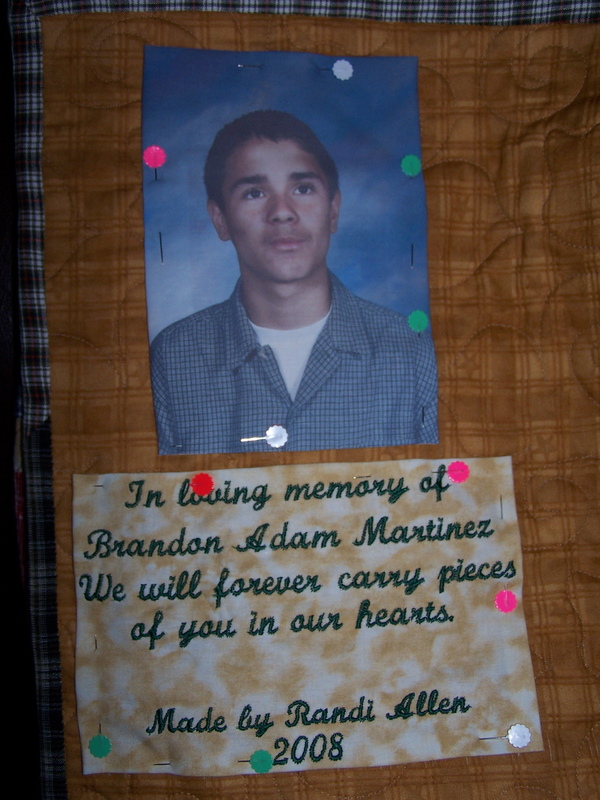 Great job on the Memorial quilt label. Great ornaments!!! 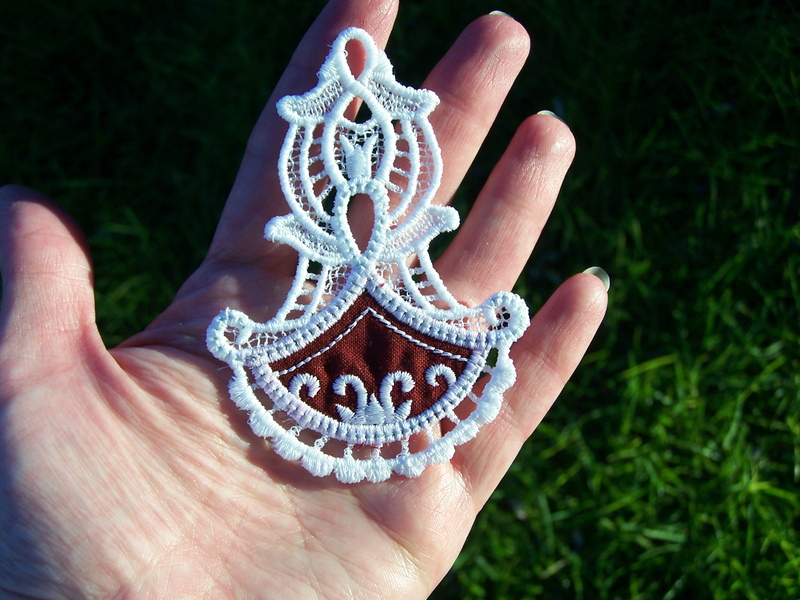 I love the free standing lace….the only thing I miss about my emb machine. Seeing your ornaments is the time I wish I had an embroidery machine. They are really pretty! Beautiful ornaments Randi. I’m glad you enjoyed your visit with your mom & dad. Have a great week. Don’t you just love those ornaments?! 🙂 They have been all the rage at my sewing club! I love the ornaments! I need to learn to use my embroidery portion of my machine……. love your ornaments…that is such an interesting technique. beautiful quilt label too! I hope you are enjoying your day… take care!